Mission Hall - A site for the history of Belgrave & surrounding areas in Tamworth, England. Belgrave Mission Hall was located next to 388 Wilnecote Lane. It was the focal point of much local community activity. Click here to see some more photographs taken inside the Mission Hall. It has since been demolished and the land remains empty. Has anyone got any photographs of the outside of the building? 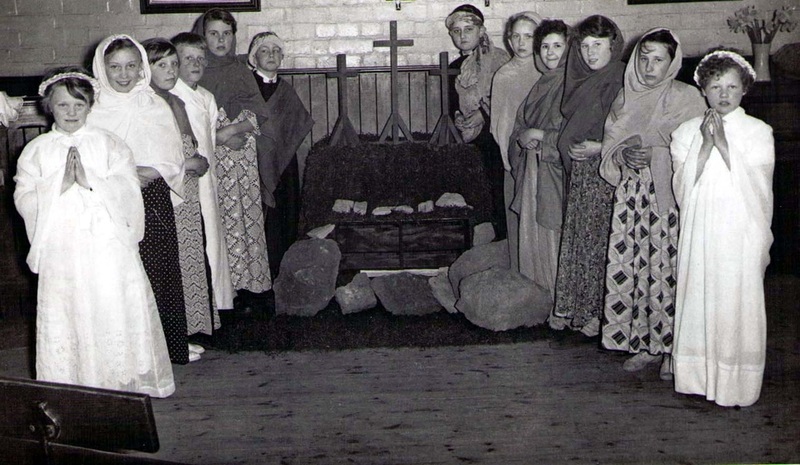 Easter 1956 – Left to Right - Sheila Crowhurst, Doreen Collins, Pat Jones, Walter Wood, Pam Oakes, David Lee, Keith Marklow, Sheila Walker, Sue Thawley, Gwen Adams, Barbara Adams, & Maureen Walker.